Suits are the most inevitable attire especially in the modern men’s wardrobe to flaunt style in their own way. From birthday parties to funeral gatherings the attire has occupied a predominant position in making man highly stick to the outfit madly. Different types of suit collections keep hitting the market continuously and people tend to choose their desired one deciding majorly on the color. Of course, going on the way match to your skin tone gives a pretty look but trying out something different that shows you special from the rest common man is opting for bold colors. The fashion color suits for modern men include mens red suits, purple suits, brown stripe suits, pink suits, yellow gold suits, mens olive pinstripe, lime green suits, royal & sky blue, peach /orange and burgundy suits. Each color symbolizes each trait for example: Pink is the charming shade which signifies smooth, gentle and loveliness, The royal blue is a striking youth color that signifies the freshness and also the color of victory, The color yellow signifies glory, joy, young and adventurous. The bold colors offer a fresh and young look and you will really look cool and dashing when you flaunt style in these shades. The royal blue is the brilliant color for nuptial ceremony; pink goes best for casual parties and dating, yellow is perfect for night parties and dinner where burgundy suits well for all types of occasions. 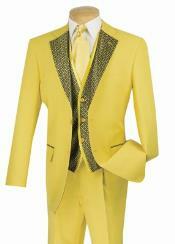 It is recommended to choose suits depending on the season and place where the celebration is going to hit. The light color shade goes perfect for summer whereas the dark colors for winter. Here may rise a question, is the fashion color suits are recommended only for winter season? The answer is strictly no. you can wear dark colored suits in summer provided you need to match your apparels and other accessories in a bit light color. If you are wearing a dark red colored jacket match it with a white shirt. If preferring for dark green jacket match it with a cream colored pinstriped shirt. The matching combinations flaunt you well irrespective of seasons and occasions. The accessories that can be paired with fashion mens suits are hats, suspenders, wallets & belts, western hats ∩s, cane, formal scarves, pocket squares, collar extenders, leather belts, tie. Some feel hard to match suits with right pair of apparels, in those cases you can buy the complete suit package that comes with matching suit jacket, pants, trousers, formal shirt, vests, classic tie, cufflinks & studs and a cummerbund set. Some of the latest fashion color suits include: 2016/Newest Slim Fit Royal Blue Groom Tuxedos, High Quality Italian Men Suit Royal Blue Tuxedo, 2016 New popular costume made groom tuxedos Gun Collar Fashion Yellow Man's Wedding Suits, 2pcs Men Yellow Tuxedo Formal Business Suits, 2016 custom made hot pink tuxedos for modern men, BESPOKE 2016 hot pink men tuxedos with black shawl lapel.